The Brain Gym® program is a system developed by learning specialist Paul E. Dennison, Ph.D., and his wife and partner Gail E. Dennison, in which simple, enjoyable physical movements are used to enhance our ability to learn, process information, and move in an organized, comfortable way in the world around us. Brain Gym is the introductory program of the Dennisons’ entire spectrum of techniques known as Educational Kinesiology (Edu-K). The “Educational” part of the name “Educational Kinesiology” does not refer specifically to school settings. The name is a reference to the Latin word educere, which means “to draw out”; the intention behind this whole system is to “draw out” innate abilities and skills — useful for people of any age! The Educational Kinesiology curriculum begins with the initial Brain Gym® 101 course, which teaches participants how to use the 26 Brain Gym movements individually, and to combine them in specific protocols to make targeted changes in Reading, Listening, Communication, Focus, Comprehension, Organization, Whole-brain-whole-body Coordination, and more. Beyond the Brain Gym® 101 course are over 600 hours of Educational Kinesiology courses, offering additional techniques for addressing challenges more directly at their core. This curriculum includes courses such as Edu-K In-Depth – The Seven Dimensions of Intelligence; Optimal Brain Organization; Visioncircles; Movement Exploration; Total Core Repatterning; Creative Vision; Hands On – How to Use Brain Gym® in the Classroom; and Brain Gym® for Special Needs Providers, to name just a few. Each course offers its own unique perspective on the mind-body relationship, and additional techniques for releasing less-helpful patterns and taking on new patterns that support how we want to think, learn, and move through life. Even with this extensive Educational Kinesiology curriculum, the entire program has come to be called “Brain Gym” – perhaps because it’s so much fun to say! 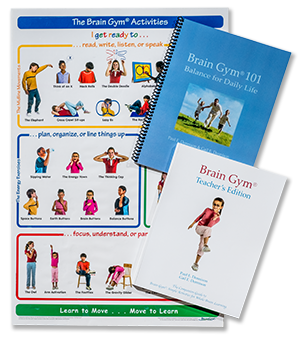 The Brain Gym program is in use in over 80 countries around the world, and its materials have been translated into over 30 languages. There are hundreds of Licensed Brain Gym® Instructor/Consultants across the United States and Canada, and more than 40 other countries around the world. How is Brain Gym experienced? • using the Brain Gym session process, which is called a “balance,” to make targeted change in regard to some aspect that you choose. At the foundation of the Brain Gym program are the twenty-six simple, enjoyable Brain Gym movements. People of all ages use these activities throughout the day to relieve stress, or as a quick mind-body warm-up before studying, writing, or sports–whatever the activity may be–bringing them back to feeling comfortable and productive. Many schools use Brain Gym activities to support students in “learning readiness.” Teachers often report that their students sit more comfortably, listen better, focus longer, write more clearly, read more easily, and learn more quickly, when they regularly incorporate Brain Gym activities throughout the day. Many teachers empower students to notice for themselves when they feel “off,” and then decide which activities would be helpful for them in that moment.This truly supports children in become independent learners, which is the ultimate goal of all education. Edu-K balances are experienced with a trained facilitator, either one-on-one or in groups. Children often choose to balance for coordination skills such as kicking the ball in soccer, or academic skills such as quickly recalling math facts. Adults may choose to address confidence in public speaking, or easily dealing with a certain person or situation. Groups (even sport teams) frequently balance for easy communication or finding simple resolutions as challenges arise. Edu-K balancing typically results in immediate, sometimes dramatic, change. Click here to learn more about the “balance” process. What aspects of life can Brain Gym enhance? Brain Gym movements and processes are used by thousands of people around the world, to make their daily lives more comfortable and enjoyable. Click here for a listing of Kathy’s articles that illustrate Brain Gym at work in many diverse ways. This Trauma-Recovery chapter is available as a free download on the Educate Your Brain website. What prevents people from working effectively together? Everyone comes to their work situation with good intentions. Teams are carefully chosen and trained to support the optimal functioning and goals of the firm. Everything should be in place for success. However, over time tensions can build and teams can lose their effectiveness. And even the best of teams can be challenged under the stresses common to today’s business environment. Individuals may recognize the difficulties and yet their efforts may not be sufficient to overcome the obstacles. Stress is more than a distraction or annoyance. It causes workers to “downshift” into the most basic survival instincts, where they react emotionally rather than respond rationally. This results in impulsivity, frustration, impaired communication, loss of focus, illness, and more, eating away at the firm’s bottom line. When stress is dealt with proactively, the result is an upsurge in energy, productivity, effectiveness, creativity, diplomacy, good humor, and well-being. Brain Gym® techniques help to “download” stress, enhance access to rational thought centers of the brain, and help participants gain perspective that reduces the “stress trigger” of demanding situations and events. Participants experience their own innate ability to be grounded, centered and focused, and learn techniques that allow them to prompt this awareness at any time. Change is a given, especially in the business world. However, change can cause uncertainty, which triggers the survival center of the brain. When this happens, the “executive functions” of the brain’s frontal lobes become less available. Calling on Brain Gym movements and processes in times of transition and change can keep our ability to think, focus, and rationally consider options much more available. Then it’s possible to see benefits instead of obstacles, in creating the chance of optimal outcome. When the stress is out of the way, creativity emerges effortlessly! The “flip side” of stress is creativity. It spontaneously springs forth in the absence of the fear and contraction that stress leaves in its wake. Creativity enhances everyone’s ability to perform. Finding the solution to a problem is an act of creativity, as are coming up with just the right words with a client or co-worker, sensing the right timing for a response or specific action, finding new means of organizing or maintaining flow or structure. A creative state is one of ease, comfort, and emotional safety. Ideas come fluidly and spontaneously. A creative workplace is one where solutions manifest easily, harmony is enhanced through clear, effective communication, and work is accomplished through a spirit of cooperation and mutual support. Brain Gym techniques allow participants easy access to their own inner, creative state. In this fast-paced world we are having to learn at a greater rate than ever before. Whether it’s new job skills or competencies, or refining our accuracy and fluency in current skills, Center Edge offers techniques that are extremely effective. What is the Total Team Effectiveness solution? The Total Team Effectiveness (TTE) program is a combination of individual and group sessions, uniquely designed to bring out the best in individuals and groups. It effortlessly removes the “charge” from frustrating or challenging situations. It can create immediate, significant improvement in group communication, effectiveness, focus and harmony. The result is a state of ease and effectiveness — for the individuals and their team. What can we expect from the Total Team Effectiveness Program? The outcome of both individual and group sessions is a shift from feeling “stuck” in reactive behaviors to effortlessly responding in the way you desire. Individual sessions are used to address personal obstacles to success, well-being, or effectiveness, effortlessly neutralizing self-defeating behaviors or tendencies. They result in a greater degree of comfort, focus and effectiveness in regard to each participant’s own role within the team. Group sessions enhance group focus and intention, and resolve any issues that may stand in the way of optimal interpersonal dynamics. Groups who go through the TTE process together communicate better, are more aligned as a team, and move toward their shared goals more effectively. Brain Gym® is often used in schools as a readiness program that supports the learner in becoming neurologically prepared to benefit from his learning environment. Brain Gym is a simple process that has extraordinary results in the classroom. Teachers around the world use Brain Gym processes and movements to help their students make immediate, positive changes in learning and behavior. How is Brain Gym used in schools? In a school setting the Brain Gym movements are easily incorporated into classroom activities. Various Brain Gym movements help us set the stage for excellence in reading, math, spelling, or composition. Simple Brain Gym “balances” for the entire class can be lead by the classroom teacher, and individual student balance sessions are often lead by the teacher or a special resource teacher. Brain Gym requires no special equipment or materials. The use of Brain Gym results in greater ease and effectiveness in any area of academic endeavor, including reading comprehension, oral reading fluency, spelling, creative writing, math computation and problem solving, memory, accuracy, focus, and attention. Test scores often rise after using Brain Gym. Students develop much greater physical coordination, agility and confidence in their own physical performance. But some of the most remarkable results come in the area of improved behavior and self-esteem. Brain Gym movements and balances create immediate and positive changes in children such as those labeled ADD/ADHD. What do educators say about Brain Gym? Brain Gym® is a powerful means of addressing specific obstacles to your success or well-being. Behaviors can become ingrained and “conditioned” through a single traumatic moment, or through actions or thoughts repeated over time. The result is an automatic reflexive behavior that can seem to defy our conscious will to change. Mind-body balance goes both ways: when the brain is balanced, so is the body. Brain Gym movements and processes enhance all kinds of physical activities. From “large-motor” activities like walking and running, soccer, golf, and volleyball, to “small-motor” activities like writing by hand, typing, knitting, and even operating a computerized game controller, a balanced brain means the both sides of the body work smoothly in coordination with each other – and your body does what you ask it to do, with precision and grace. How is Brain Gym learned? Licensed Brain Gym® instructors offer a wide variety of courses from the Educational Kinesiology curriculum, as well as shorter introductory workshops. Depending on their length (one hour to full day) Introductory Workshops may include a few, or all of, the Brain Gym movements, and a taste of what the balance process is like. 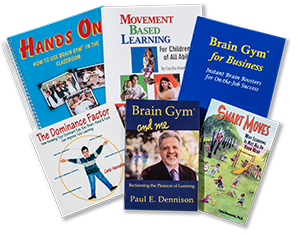 It is also possible to learn about the 26 Brain Gym movements in various books. We recommend Brain Gym® Teacher’s Edition. (which is of use to many people beyond education!). Kathy’s book, Educate Your Brain, offers information on 12 key Brain Gym movements that most people tend to use initially. Brain Gym “balance” protocols, for seeing/reading, listening, writing/communication, focus, comprehension, organization, and whole-body coordination. Dennison Laterality Repatterning® to powerfully integrate the right and left hemispheres of the brain, creating communication and coordination throughout the mind-body system, as well as its companion, Three Dimension Repatterning. There are no prerequisites for entering the Brain Gym licensure process. Instructors come from all walks of life. While many are teachers, occupational therapists, or others in similar fields, quite a few are parents who took their child with “learning challenges” to a Brain Gym consultant for sessions and were so amazed at the changes they saw, that they wanted to learn the system, as a support for themselves, their families, and others. In North America, the requirements for becoming licensed include about 240 course hours of instruction, including a four-day Teacher Practicum. Most people accomplish this goal over about two years. Click here for the Licensure page on the Brain Gym website. In developing countries, the requirements are fewer. If this interests you, please contact the Foundation office. • share informally, especially from a place of their enthusiasm! Once people are licensed, they are authorized to teach Introductory Workshops and the Brain Gym® 101 course, and charge a fee for Brain Gym “balance” sessions. Where can I look for further information on Brain Gym? Helpful links include these; there are many more. Kathy Brown’s office stocks all the main book titles and posters. attend a class, or arrange for an office visit for this purpose. The only book Kathy is set up to ship is her own book, Educate Your Brain.